PHOENIX - June 6, 2016 - PRLog -- Shade Projects is proud to present Gray Area, a small group exhibition of that will showcase the work of three artists AJ Nafziger, Jessica Palomo, and Travis Rice in Shade Gallery. Gray Area features the work of three artists who reveal drawing as an advanced and complex practice and an artistic channel for discovery. According to the artists "Drawing is something we all do throughout childhood, scribbling on paper as we learned to express and explore our visual experience and remains at the core of most artistic practice, so much so that it is can be underrated as an advanced practice in its own right." The artwork of Travis Rice, Jessica Palomo, and AJ Nafziger vary greatly in aesthetic, using a wide range of alternative processes, demonstrating the tremendous depth of the pool of techniques, mediums, and styles artists use to draw. All of the artists work demonstrates a different balance somewhere between strict representation and nonrepresentation and explores the roles of uncertainty and the conflict of chance and planning. Together our work provides a strong demonstration of these themes and an interesting set of examples of unexpected diversity and techniques of drawing as an art form. The theme, Gray Area, is reflected in these elements of discovery and uncertainty, as well as in the use of gray to create vibrant work in the absence of color and the vague definition of how the process of drawing is represented in art today. "We are thrilled to welcome this talented group of artists to Shade Gallery and are excited to share their work with the community, as well as offering them support and encouragement as they continue their artistic journeys", states Shade Projects Curator, Nicole Royse. These talented artists have been busy creating and getting involved in the phoenix art scene, having the incredible opportunity of having their studios in ASU Grant Street Studios where they share and push their creative process and work. Aj Nafziger holds a Bachelors of Fine Arts in Studio Art from University of Indianapolis and he recently completed his Masters of Fine Arts from Arizona State University. Jessica Palomo holds a Bachelor of Fine Arts from Southern Methodist University and she is currently pursuing her Masters in Fine Art at Arizona State University. Travis Rice holds a Bachelors of Arts from Iowa State University and is currently pursuing his Masters of Fine Arts from Arizona State. Each artist offers a unique voice, background and varied artistic experiences that have impacted their style and artist careers thus far. The monOrchid and Shade Projects curator, Nicole Royse will host the Opening Reception on First Friday, July 1st, 2016 from 6-10pm with the artists in attendance. The closing reception will be held on Friday, July 22nd, 2016 from 6-9pm. 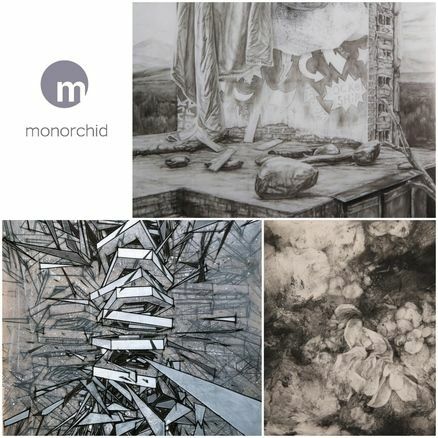 Gray Areawill be on display in Shade Gallery at the monOrchid from July 1st until July 24th, 2016.Please visit our website for more information at http://www.monorchid.com and all exhibition inquiries please contact Shade Projects Curator, Nicole Royse. Opening reception of Michael Viglietta's "Eroding Languages: People, Places And Things"